Yankees Roster: What’s the Best Course of Action in April? It’s about that time of year where minor clues start to be handed out like early Easter eggs during spring training and it coincidentally coincides with another annual Yankees’ tradition: Pitching injuries. Chris Capuano is the first to go down, straining his right quad and leaving the door open for any of: Adam Warren, Scott Baker or Bryan Mitchell to have to make at least one start during the first half of April. What we know about the rest of the team so far is this: Jacoby Ellsbury and Brett Gardner are likely forming a lefty-lefty 1-2 punch at the top of the lineup. 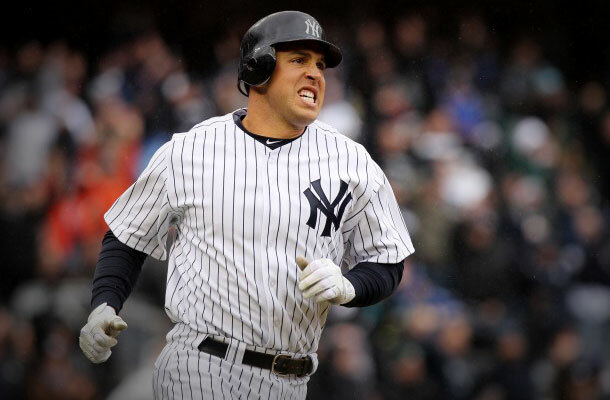 Not long after, Mark Teixeira should be batting cleanup and it’s highly likely Alex Rodriguez will at least start the year as low as seventh in the lineup. Joe Girardi typically likes his probable lineup to form early, and he’s used the same one back to back games. We know Alex Rodriguez is likely to be the backup third baseman and if he’s not available it’s highly likely Jose Pirela, the front-runner offensive rookie to join the team, will be there instead as a super utility player on the roster. With Garrett Jones able to play right field and Brendan Ryan unlikely to be thrown away salary this early in the year, it’s highly likely Pirela will make it over Rob Refsnyder. The bullpen will sort itself out and include Dellin Betances and Andrew Miller in the late innings (smart money is on Betances to close) with David Carpenter and Justin Wilson getting first opportunity for those crucial sixth and seventh innings. Of course, Adam Warren could team up with Carpenter instead if he’s not summoned to bridge the gap in the rotation to begin the year and it’s likely that will be the case with Chase Whitley acting as a potential long man and Scott Baker or Bryan Mitchell being inserted into the rotation. New York has a few different approaches it can take as far as its final issue, the order and roster for the starting pitchers. Whoever pitches Opening Day against the Blue Jays will get an extra day off, unless the Yankees choose to skip the fifth man against the Red Sox. The fifth man in the rotation will either pitch the middle game of a Sox series at home, or the final game of a three game set against the Orioles on April 15th. Capuano is shut down for two weeks, pushing his return to baseball activities towards the last week of March. Girardi made a comment about how he would likely have to start over, which means he’s starting the year on the DL and is likely not going to return until the third week of April at a minimum. The Yankees are likely targeting an April 21st return vs the Tigers on the road for Capuano, which means 1-2 starts from a different fifth starter. Seeing as CC Sabathia, Michael Pineda and Masahiro Tanaka could all use an extra day of rest anywhere available, it’s highly likely Girardi will start one of them Opening Day and then stick to the five man rotation from the onset. Since Sabathia and Tanaka are on the same schedule but public comments have been made about how slowly they will take it with Sabathia, smart money is on Tanaka getting the Opening Day start, Pineda pitching game two, Sabathia as the lefty in the middle getting extra rest between the end of spring and his first start in game three and then likely whoever performs better between Mitchell and Baker for game five. If Mitchell performs well enough in the spring, it’s his job to lose since Baker would get a $1.5 million dollar salary at the MLB level and Mitchell has options. So for those keeping score, it’s Tanaka pitching Opening Day and getting an extra day of rest for his second start, followed by Pineda and Sabathia and then Eovaldi and Mitchell, with Whitley and Warren in the bullpen and Miller and Betances closing games in the eighth and ninth respectively. Though he would never admit it, this also lets Girardi skip Sabathia against Boston in his first start. Expect Capuano, barring setbacks, to return either April 21st or April 22nd and then Mitchell optioned to AAA to join Baker in the rotation. Capuano will be given about a month to show what he can do and then will also be added depth in Scranton when Ivan Nova comes back, hopefully at the end of May. It’s the end of the rotation, final spot at backup infielder and signs of the future worth paying attention to in Spring Training for the Yankees this year, but Capuano is always a reminder things can change immediately.